New Zealand native Bush Cockroaches are invading homes where warm moist weather in parts of the country is encouraging them. There are about 15 species of Native Bush Cockroach. They are small wingless cockroaches, up to 15mm body length. They can often be mistaken for the Gisborne cockroach which is also a 'Wood Cockroach' like the Bush but is more likely to be a nuisance pest. The Gisborne will grow much larger; growing to over 30mm. 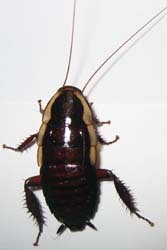 The Bush Cockroach normally lives in logs and leaf litter or under loose bark. 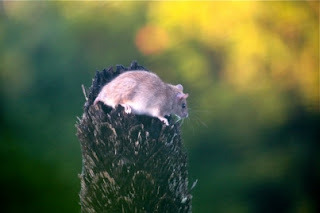 They prefer damp, dark habitats and are not usually a household pest. However, when they do invade a home,wandering in from the garden or brought in on wood for the fire, they can cause a certain amount of revulsion and consternation. They will not survive long in most homes as it is too dry where there is heating and there will be a lack of their normal food of rotting vegetation. But 'not long' can be several weeks and it maybe that home owners want to get rid of them sooner. Preventing the entry of Bush or Gisborne cockroaches to the house or other buildings is the first thing to do. Make sure doors and windows are tightly fitting and keep vegetation and bark chips away from the house. Don't store firewood close tot he house and take care when bringing the wood indoors not to carry cockroaches with it. The use of residual insecticide such as NO Bugs Super inside and around the walls and possible entry points can deter the roaches and shorten their life in the home. But it is not necessary to use insecticides in the garden where they cockroaches are not a threat and pose no risk of harm. It is only when they move inside that that can be a nuisance. "I was in that new restaurant across the street," said one roach to his mate. "It's so clean! The kitchen is spotless, and the floors are gleaming. There is no dirt anywhere--it's so hygienic that the whole place shines." "Please," said the other roach. "Not while I'm eating!" The recent news reports of some SkyCity staff resorting to wearing flea collars to prevent fleas in the casino biting them, raises some interesting points about fleas, flea control and the effectiveness of flea collars. SkyCity say that they have regular cleaning of the casino and have a pest management program in place to deal with such pest issues. This is normal practice for any business catering for visitors and handling food or drink. I do not believe wearing flea collars, even if they are worn around the ankle are an effective way to prevent bites, and pet flea collars may not be approved for use on humans. A good flea control program should deal with the flea infestation promptly. However, getting rid of fleas may not necessarily get rid of the itching experienced by staff. It is well known that just thinking about fleas, bed bugs or other biting insects can induce us to feel itchy and cause scratching. Are you feeling itchy yet? Scratching of the skin, which often happens subconsciously, will in turn cause inflammation and more itchiness. This feedback loop can easily lead people to think that the biting insect problem is continuing. There is also a social aspect of this phenomenon; if you see someone else scratching or they discuss feeling itchy, you will too, and so the phenomenon can spread through the staff. The 'trick' to terminating the perception of fleas or other biting insects is to make it plain to the affected staff that a proactive and effective flea control operation has taken place. Wearing flea collars is only likely to keep fleas in the mind. How do you find where a flea has bitten you? The increase in the South Island is largely due to cluster flies hitting Southland in a big way. Invercargill, Southland has seen number of visits increase (24, 26, 167) over the three years. This is an interesting switch. It has been reported previously that cluster flies seem to go through a ‘boom bust’ cycle in local areas. My suspicion would be that this is governed by both weather conditions and the availability of their earthworm food source. If they are in big numbers for one or two years in an area, they may significantly reduce worm numbers and so suffer a drop off in their own numbers the following season as a consequence. This fly goes into a bar and says "Is this stool taken?" A report in the Journal of Emerging Infectious Diseases* this month reports that bedbugs carrying methicillin-resistant Staphylococcus aureus, or MRSA, a bacterium resistant to many common antibiotics were found on patients in a Vancouver hospital. Also, on two patients, they found bedbugs with vancomycin-resistant Enterococcus faecium, or VRE, another bacterium resistant to common antibiotics. This result raises the possibility that bed bugs can carry and transmit disease, something that has never been shown previously. 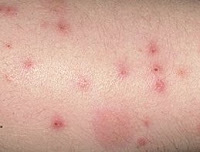 While this result does not demonstrate that the bed bugs transmitted disease during their blood feeds it shows that there is the possibility. This result will, no doubt, spark further investigations around the world. Should this result be confirmed and the transmission of disease by bed bugs during taking blood feeds from people and animals demonstrated, this will have great implications for the control of bed bugs around the world. As I have previously blogged, there has been a resurgence of bed bugs around the world and in New Zealand. The combination of this resurgence and evidence that bed bugs transmit disease would be most concerning. It would make the control and eradication of bed bugs not just a matter of preventing nuisance and itchy bites but a matter of preventing serious disease and illness. *The Journal of Emerging Infectious Diseases is a journal of the US Centre for Disease Control (CDC). A bed bug walks into the tearoom and says "Is it chai?" The tragic case of the death of New Zealander Sarah Carter and other travellers in Chang Mai, Thailand, may be a case of pesticide poisoning according to a United Nations scientist Dr Ron McDowall. Dr McDowall has revealed that traces of the organophosphate chlorpyrifos were found in the hotel in which Sarah was staying at the time she fell ill. It was the same hotel that a British couple, a Canadian and a local tour guide stayed in before their deaths in similar circumstances. According to Dr McDowall the symptoms of the deaths were in line with those of chlorpyifos poisoning. It is thought the insecticide may have been used for the control of bed bugs and Thai police will be investigating. The use of chlorpyrifos for indoor pest control has been banned in many countries. Because bed bugs are predominantly found in bedrooms and other places where people spend large amounts of time it is important that any insecticide used is particularly safe. Kiwicare NO Bed Bugs spray and fumigator products do not contain organophosphates, instead containing the very safe low toxicity pyrethroids permethrin, cyphenothrin and an insect growth regulator, pyriproxifen; all of which are insecticides approved for bed bug control in bedrooms by the US Environmental Protection Agency. 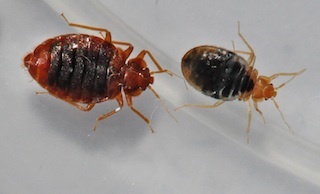 Bed bugs are difficult insect pests to control and there is a danger that pest control operators, under pressure to eliminate the bugs quickly, will be tempted to use more powerful chemicals. This may be particularly the case in the accommodation businesses where room downtime and bad publicity from bed bugs is very costly. It is almost certainly the case that, if the death of Sarah Carter was caused by chlorpyrifos (aka chlorpyriphos), it was not just due to using the chemical, but the extreme over use of the chemical. I find it difficult to imagine how chlorpyriphos could be used at the strength required to cause illness and death. I am aware that some 'professional' pest control operators in New Zealand use organophosphates for control of bed bugs. It would be hoped and expected that any such pest control companies would use these chemicals in a safe manner. But I would advise the use of the much safer NO Bed Bugs spray and fumigator in conjunction with the time and effort to find and treat all the possible bed bug hiding places. I had an interesting enquiry from a home owner in Auckland's North Shore along with a series of great photos. 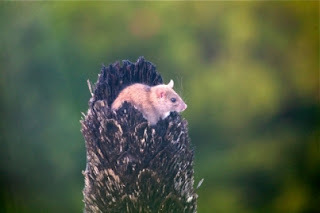 Graham sat at his kitchen window shortly after the tornado that devastated parts of Albany and watched a young Norway rat sitting in a fern stump for 10 minutes before making a get away. It is possible that the heavy rain the accompanied the tornado flushed the rat out of its burrow. Norway rats, sometimes referred to as brown rats, water rats or sewer rats, normally live in burrows, often near river banks or sewers. So rising water can flush them out. It’s cousin the Black rat (aka roof rat, ship rat) is arboreal and lives more in trees and high places such roof spaces. 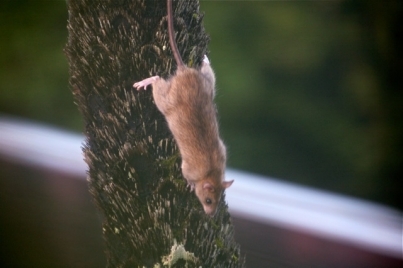 The pale colour of this rat is not uncommon, the Norway rat can vary from dark grey to even paler than this individual. The very pale underside is the easy way to differentiate Norway from Black rats. 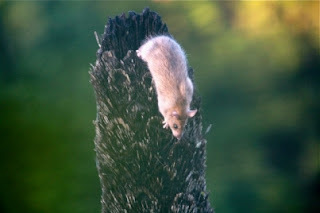 Graham said the rat slowly walked down the fern stump and he was amazed how agile it was. 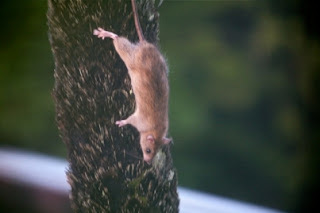 Norway rats are good climbers as can be seen by these photos, but they are not as good as Roof rats. It is good advice to make sure trees and vegetation do not lead to your roof. Rats and mice will readily climb a tree and drop down onto a roof where they are likely to find a way in at the eaves. I suggested Graham set some bait out for this rat and his friends. NO Rats & Mice weatherproof blocks would be most suitable. Use short lengths of pipe such as spouting down pipe approx 60cm long. Place the bait in the middle in a plastic bag and secured by a piece of wire or nail through the pipe. Rats and mice will happily eat through the plastic bag and the bag will keep the bait in place and fresh for longer. The bait tunnel should be placed securely against a wall or where rats have been seen travelling. Rats prefer to be in enclosed spaces and the tunnel will protect the bait and keep pets and birds out. Check and replace bait regularly and continue until no more bait is taken. Thank you to Graham for letting me use his great series of photos. Did you hear about the dyslexic rats? Each thought they were a star. In my blog of on catching rats and mice alive on Monday July 19th 2010 I ended by saying I would tell the story of the Mars Bar mice. It has taken me a long time to get round to it, but a comment on that article has reminded me of my promise. Some years ago, back in Ireland, I was contacted by the owner of a business located in the same business centre as my pest control company. We'll call him Paddy which wasn't his name, but it suits the story. Paddy told me that he was having terrible problems with mice at home. He said he was catching as many as 20 every night. Now, I have seen some heavily infested homes, but never one where that many were caught every night. I queried these numbers and it transpired that Paddy had purchased 20 live capture mouse traps; his wife was "dead set against using poison, even if the mice were eating her cashmere sweaters to make a nest." Paddy had been setting the traps all in his roof voids and around the house, baited with Mars Bar. Each morning every trap had caught a mouse. "Big fat healthy mice!" said Paddy. I asked Paddy what he did with the caught mice. "Oh. I take them way across the field and let them go." said Paddy. I suggested that that night he set the traps again as usual. But next morning, mark each mouse with a dab of correction fluid before releasing them. And set the traps again for the following night. Sure enough the second morning 20 'corrected' mice had been caught in the traps. The mice were fat from Mars Bar and fit from the exercise and fresh air they got each day making their way back across the fields to the house for another Mars feed. This wasn't quite the end of the story however. There was still the question of how the mice were getting back into the house. Paddy insisted that he had put much effort into finding and sealing all possible entry points. I agreed to visit the house and take a look. It doesn't take much of a gap for a mouse to enter a building; a gap as narrow as a pencil is all they need, even well fed Mars mice. I was confident I would find a broken air vent, gap under a door, ill fitting pipe, or climbing plant leading up to the eaves. But when I checked the house I could find no possible entry. It was unlikely that all the mice would be able to sneak in an open door when Paddy or his wife opened and closed them after themselves. How could they be getting in? A common entry point for rats and mice is via the garage if the garage is attached to the house. But Paddy's garage was 15 metres from the house. But I did find a gap under the garage door and I found little 'messages' letting me know that mice were getting into the garage. In Ireland and the UK central heating is common in most homes to combat the cold, wind and rain. Rats and mice love the heat from central heating boilers and the pipes carrying hot water to radiators. The pipes can often provide highways for mice to travel around a building as the holes on walls and joists are rarely sealed tightly. And this was how the mice were getting into the house. Paddy's central heating boiler was in the garage and the pipes ran underground to the house. the mice had followed the pipes, eating their way through the insulation around the pipes. Once I sealed up the gaps around the pipes, and Paddy had caught and released the mice a long way (over 2km) away from the house, the problem was solved. A mouse walks into a bar and says to the barman "I'll have a Milk 'n' way and two Moro a Mars." The National Education and Training Seminar (NETS) conference, NETS2011 Tomorrow's Pest today, is to be held 6th - 8th July 2011, at the Bruce Mason Centre, Takapuna Auckland. NETS is the annual conference of the New Zealand Biosecurity Institiute (NZBI). If you are interested in biosecurity (the protection of New Zealand environments from invasive animals, plants and diseases) or the biodiversity (protection of the diversity of native New Zealand flora and fauna) of the country then come along to learn about the threats and what organisations around the country are doing to protect and prevent pests. A draft programme is available here and information on pricing and accommodation can be found here. Online registration to NETS2011 is now open and all members and non-members are welcome to join us for a fun packed and informative three days. Three animal pest guys and three pest plant people are going to NETS by train. They meet at the station. The pest plant guys say "With things tight we can't afford three tickets but we have a plan to buy only one." The animal pesties watch as the three plant pesties buy one ticket and then get on the train and squeeze into one restroom. When the conductor knocks on the door and says "Ticket please" the ticket is slipped under the door. Thinking this was a smart way to save hard to find money the animal pesties decide to do they same thing on the return journey. But they notice the plant pesties don't buy any tickets! On the train the animal pesties are squeezed in the restroom when a plant pestie knocks on the door and says "Ticket please."